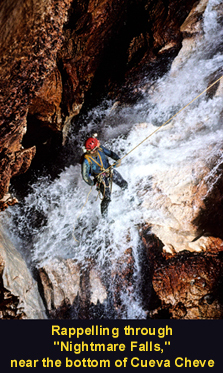 In 1987 Cueva Cheve was first discovered by modern explorers at an elevation of 3,000 meters in the Sierra Juárez highlands of northeastern Oaxaca, México. It is presently 1,484 meters deep and is the deepest known cavern in the Western Hemisphere and the world's 11th deepest. The present limit of exploration in Cheve - at 9.3 kilometers from the nearest entrance - represents one of the most remote locations ever attained inside any cave on Earth. The logistics of reaching this point are enormous: more than two kilometers of rope need to be rigged and three underground camps established. The final depth was achieved during a 3-month U.S.-led expedition in 2003 that succeeded in placing a 4-person dive team beyond two flooded tunnels at the -1,362 meter level. The dives were highly successful and the team rapidly explored an additional 1.3 kilometers of new terrain leading deeper into the mountain. The effort was ultimately halted by an ancient tunnel collapse that blocked the route forward. No one has since returned to Cueva Cheve and the mystery of what remains to be discovered inside the Sierra Juárez endures. However, in 2004 an international reconnaissance expedition led by the U.S. Deep Caving Team discovered a new cave named J2, located high in the remote cloud forest of Ocotal, just 5 kilometers northeast of Cheve. It quickly became apparent that J2 was going deep and headed in the direction of Cueva Cheve with a projected intersection beyond the underwater tunnels that stopped the team in 2003. During the course of three major expeditions in 2004, 2005, and 2006, J2 was explored to 10 kilometers from the nearest entrance at a depth of -1,209 meters. To get there the team passed two underwater tunnels -- Sump 1 at the -633 m level, and Sump 2 at the -1,201 m level. The second dive of 150 meters led to an air-filled chamber and a third sump. Sump 3 remains unexplored but the geology strongly suggests that it will be short and that large air-filled galleries will be located beyond that will lead northwest to the hypothesized Cheve trunk. Getting there will require pushing the envelope. To do this 20 members of the 45 person international 2009 J2 team are in training to use the radical Mk6 rebreather designed by Poseidon Diving Systems. The briefcase-sized system is small enough to be transported to Sump 2 where the main push will begin in March of 2009. Lead divers will explore Sump 3 and lay a safety line. Teams of 6 to 8 persons will then commence the exploration of what lays beyond in what will surely be one of the most remote and exciting original exploration projects of this decade. The expedition will stage out of Austin, Texas the second week of March of 2009 and will be in the field for three months. The primary objective of the expedition in March 2009 will be to explore Sump 3 in J2, establish subterranean Camp 4 in the air-filled tunnels beyond, and extend exploration toward the hypothesized central trunk corridor inside the Sierra Juárez. Should this effort be successful the effort in April and May will focus on extending exploration of the trunk tunnel south towards Cheve and north to the resurgence springs. 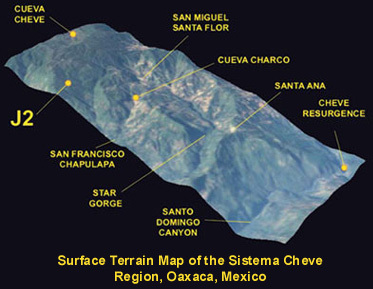 A connection with Cueva Cheve will produce a cave system more than 2 kilometers in depth. The integration of the entire system will produce a 2,597-meter-deep cave and would represent the deepest natural abyss yet discovered. The current limit of exploration in J2 represents totally unknown territory. The above map shows the surface topography (in plan view) together with the known major cave systems of the Sierra Juárez. 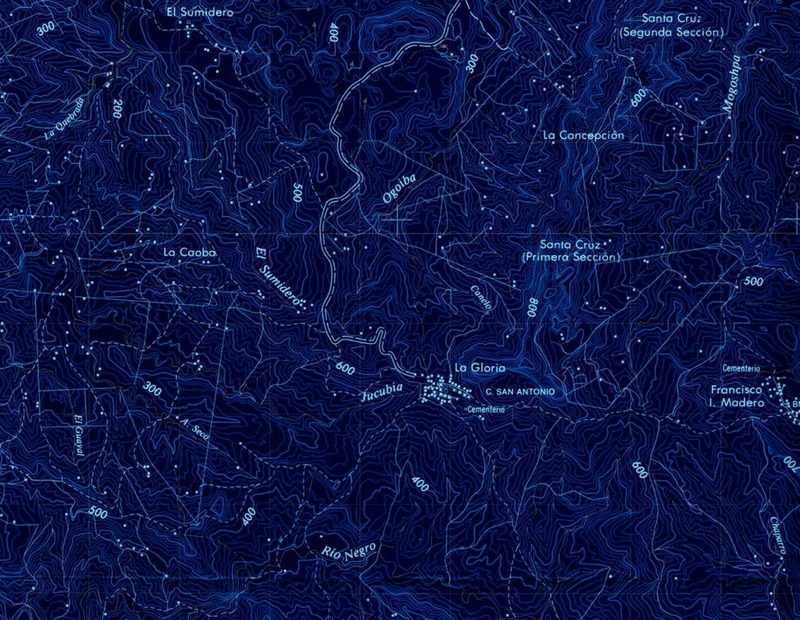 The dashed blue lines represent a very simplified hypothesis for what might be discovered beyond these known limits. What is known was obtained through difficult exploration during 14 expeditions over 21 years time. The distance actually traveled underground can be two to three times the straight-line surface distance. It is approximately 10 kilometers of underground travel from the entrance of J2 to the beginning of Sump 3. This is well beyond the limits of human endurance. To deal with this we break the journey into portions that represent 8 to 12 hours one-way travel time with a heavy backpack and establish underground camps at those locations. There are currently three such camps in J2, with the deepest (Camp 3) being at the -1,100-meter level and within a half day's travel to the start of Sump 2. We plan to immediately establish a bivouac camp in the chamber between Sumps 2 and 3 while the initial exploration of Sump 3 unfolds. We will then establish Camp 4 proper in the nearest dry area beyond Sump 3 and continue exploration downstream from there. The map is illustrated with red and yellow circles that mark the known and projected camps that will be required to explore all of Sistema Cheve from the J2 entrance. For point of historical reference, no one has ever established a necessary string of more than three underground camps in a cave. We are anticipating as many as 11 to make the downstream push towards the resurgence and 9 to reach Cheve in the upstream direction. Since each camp represents a day of underground travel, a fully successful exploration of the heart of the Sierra Juárez will involve underground stays approaching one month or more. 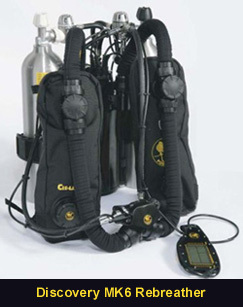 In collaboration with expedition sponsor Poseidon Diving Systems of Sweden, the expedition is developing a custom version of the new briefcase-sized Mk6 rebreather for use in J2. The Mk6, at less than 15 kg, will allow the J2 lead- and support-dive teams to work underwater for over 3 hours at 60 m depth. To read the results of the 2009 J2 Expedition, here are high resolution (37MB) and low resolution (1.6MB) versions (in PDF format) of the full report published in the January 2010 and February 2010 editions of the NSS News.